Accessories: Accompanied by Patek Philippe Certificate of Origin dated November 9, 2009, product literature, leather wallet, fitted presentation box and outer packaging. Stylish and bold, reference 5180 features a fully skeletonized movement and dial, along with a luxurious and lavish white gold rice grain bracelet. 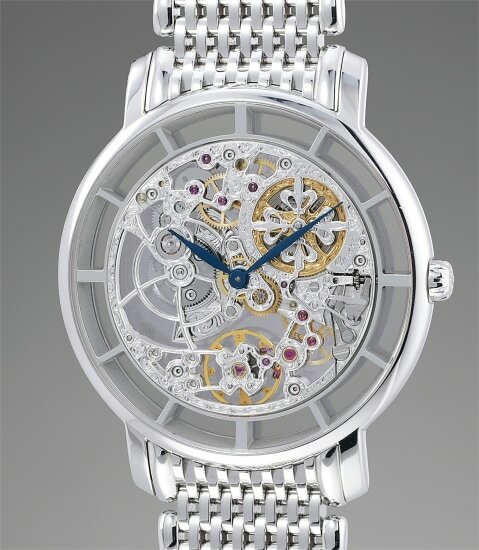 At the time of launch in 2008, it was an instant hit among the horological community. Patek Philippe's quality of production is second to none, and the bridges and components have been painstakingly hand-engraved, attesting to brand's commitment to excellence. Furthermore, the 39 millimeter case provides a hefty presence on the wrist. Preserved in excellent and barely worn condition, the present timepiece is complete with its original accessories, such as the certificate and presentation box.